Bangkok (VNA) - An average of 75 percent voter turnout was reported in the March 17 early voting for the general election in Thailand, according to an official from the country’s Election Commission (EC). 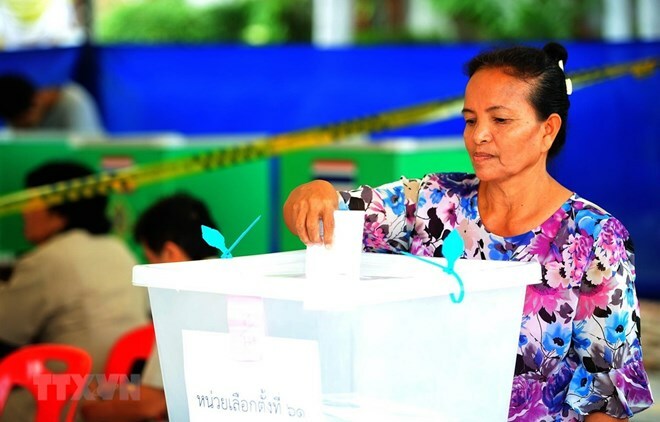 Of a total of 2.63 million Thais who had registered for early voting, over 75 percent reportedly cast their ballots on March 17, one week earlier than the official election date on March 24, confirmed EC Deputy Secretary General Nat Laosisavakul. Bangkok's constituency with the largest number of registered early voters was in Bang Kapi district, where up to 82 percent of those registered cast their ballots, Nat said. In Chiang Mai, up to 95 percent of some 47,000 registered early voters went to the polls. According to the EC’s deputy secretary general, those who had registered as early voters but failed to cast their early votes on March 17 are not allowed by law to do so on the election day of March 24.